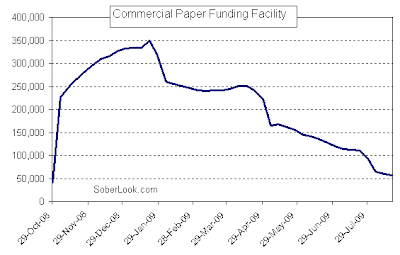 One of the reasons the declines in the commercial paper markets have been gradual rather than falling off the cliff in October of 08, was the Fed's program called Commercial Paper Funding Facility (CPFF). The CPFF will provide a liquidity backstop to U.S. issuers of commercial paper through a special purpose vehicle (SPV) that will purchase three-month unsecured and asset-backed commercial paper directly from eligible issuers. The Federal Reserve will provide financing to the SPV under the CPFF and will be secured by all of the assets of the SPV and, in the case of commercial paper that is not asset-backed commercial paper, by the retention of up-front fees paid by the issuers or by other forms of security acceptable to the Federal Reserve in consultation with market participants. The Treasury believes this facility is necessary to prevent substantial disruptions to the financial markets and the economy and will make a special deposit at the Federal Reserve Bank of New York in support of this facility. For those who were unable to sell commercial paper in the market could go to the Fed and place the paper with CPFF. Even GE Capital ended up using the facility last fall, as it became clear it would have trouble rolling it's paper. The stronger issuers like GE stopped using the program as soon as they could find private buyers. Many weaker issuers however continued to rely on CPFF. These costs dropped somewhat a month after the program was launched, but remained almost constant since then. Given that the assets financed with commercial paper tend to have a floating coupon, CPFF created a mismatch between assets that are yielding increasingly less and the financing that's almost fixed. 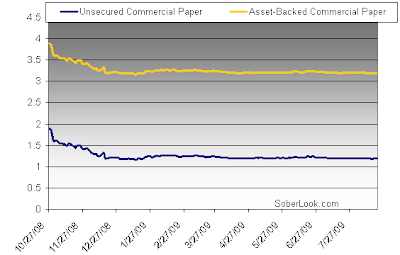 The market based commercial paper rate however, continued to fall (with LIBOR). Those who are able to issue paper privately are getting increasing cheaper financing. Overall the program kept corporations (including GE) and bank facilities from a complete liquidity crisis, creating gradual wind-downs or a migration to private sources. Ironically the Fed has made a bundle on the program. 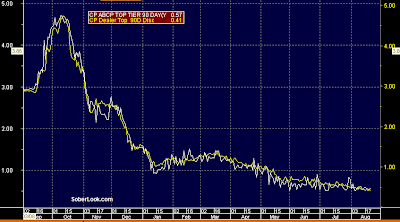 There haven't been any defaults and with the 300 bp spread on ABCP and 100 bp upfront for unsecured CP, it's has been a good deal for the Fed.